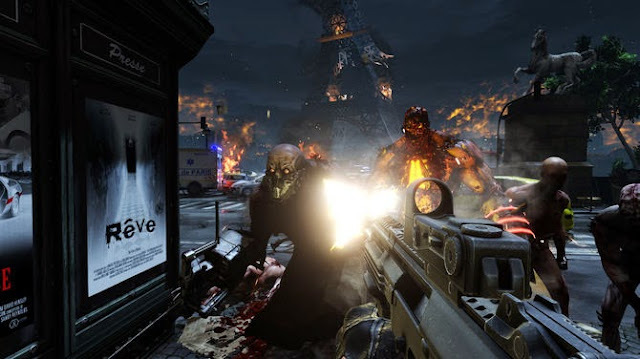 In Killing Floor 2 you will encounter 9 different enemy types that you must fight. The aim is to complete wave after wave successfully, by killing your opponents and thus pocket money, with which you can purchase your new equipment. Have you passed the last wave successfully, followed by a boss, someone who applies defeat. Note: Almost all your opponents have a weak spot - his head! Description : Clots are the standard enemies that you have to probably also the most combat. Individually they represent hardly pose a threat, even if they appear in a group, you can escape them easily. Ability / Skills: The Clot has the ability to hold you, you should come too near him. This can be rapidly fatal! Especially when one is caught up in something other enemies. Description: Crawlers are black as night. They move on all fours and have more spider-like limbs that they use for locomotion, which is why they clearly belong to the faster enemies! Ability / Skills: The crawler can run along walls and is almost invisible in darker areas! Description: On their hands they wear long blades. A skin seems almost not to be present, which is why their muscles are highly visible. Ability / Skills: If a Gore almost comes close to you, he charges at you and attack you with his sword. The damage he hands out, should neither be underestimated, as his health. Description: A stalker is similar to a clot and is represented exclusively in female form. Ability / Skills: The Stalker is invisible until he attacks you in melee. Using a special ability (see picture) are their outlines still recognizable. Description: A Bloat is large and very overweight, which makes it also very slow. Ability / Skills: If you close to the Bloat, it is not the ax, which should scare you, but the acid with which he spats at you. Not only that your field of vision is greatly limited by his addition few seconds damage. Description: Instead of his right hand, has a kind of Husk fireball launcher. Ability / Skills: Due to his ability to Ranged there is a risk to collect a hit without having seen him before. His range is large, the damage enormously. He needs luckily some time to fire again. Description: The siren acts as a female zombie, whose hands tied to the body. Ability / Skills: Although her hands are tied to her body, but unfortunately she does not need this also. If she cries near you, lose herr lives and your field of vision becomes blurred. Description: Resembles a butcher, only that he leads a chainsaw instead of an ax with him. Ability / Skills: If you too near to Scrake, it may be that he unleashes a combo, which is washed. Quite often mean his attacks instant death! Ability / Skills: Turns the light from yellow to red, goes Flesh Pound on the attack. He pounds on the ground, everything is damaged in his district. Ability / Skills: His default weapon is a type of machine gun. He uses both poisons, as well as flue gas. He grabs you, it is this time, which means more than invulnerable, that your comrades should better give no shot to save ammunition.